Camping in our family is kind of a big deal. Most of our vacations involve some form of sleeping in our restored 1970s Apache Eagle tent camper, and even before the Apache we tent camped at least twice a year. 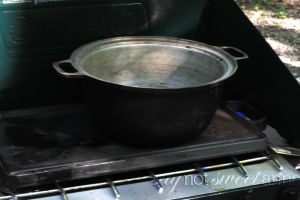 My extended family gets together and camps for a week or two every August, and hubby and I’ve camped our way through a 3 week Beetle trip as well as a 12 day Smokey Mountains visit. So yeah, we know our camping. There are some staples in our repertoire, like the Campfire Monkey Bread, the Orange Peel Cinnamon rolls, and I’ve even made some Camp themed journal cards to use in our memory keeping. 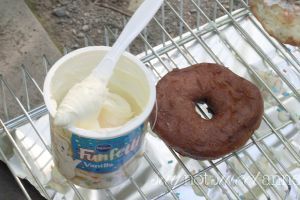 Well now that we’ve tried camping donuts – I’ve added a new favorite to the list of camping recipes! In our trip to the Smokey’s, hubby and I wanted to keep a few of our weekly traditions in place to make the trip easier on our toddler. He’d never been away from home that long, and we had no idea how he was going to take to living out of our camper for days on end (spoiler: he loved it). Since every Sunday we walk to get donuts before church, we decided to make donuts every Sunday while camping as well! I know what you’re thinking. “Donuts Camping!? Yeast, bread making, rising all that while camping! ?” Oh no. Definitely not. We took a page from the Campfire Monkey Bread recipe and started with biscuit dough. Then, with some hot oil and a can of frosting (with sprinkles, since The Squish always gets a sprinkle donut at home) we were munching on delicious warm donuts and sipping an amazing french-press coffee. The food plus the view beats anything we get at the donut shop back home. Pop your biscuits and cut a hole into the center of each. We used a water bottle to make the holes, but you could use a sharp knife as well. Cook the donuts one or two at a time, flipping when golden in color. 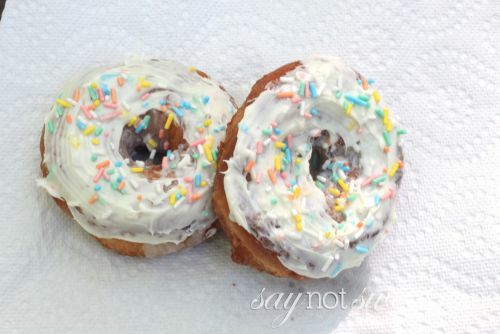 Remove the donuts and allow them to cool a bit on a wire rack or a paper towel. When still a bit warm, frost the donuts with the frosting and watch it melt/goo before your eyes! Bonus if you top with sprinkles. We’ve done this at home, but never at camp. Great easy idea for a camp breakfast. Jason – you definitely should try it camping! It is a great way to start a day, and feels extra special because you can’t just go buy donuts! I have visited this recipe a dozen times, it looks soo good! We will be making these on our camping trip in 2 weeks. I have an idea to make donut holes out of the cut outs, shake them in cinnamon sugar and fill some nutella in them. We will let you know how they turn out! Jamie – Nutella filled donut holes sound AMAZING!!! Be sure to tag me on Facebook or something (Sweet Anne Designs) so I can see how it turns out! !